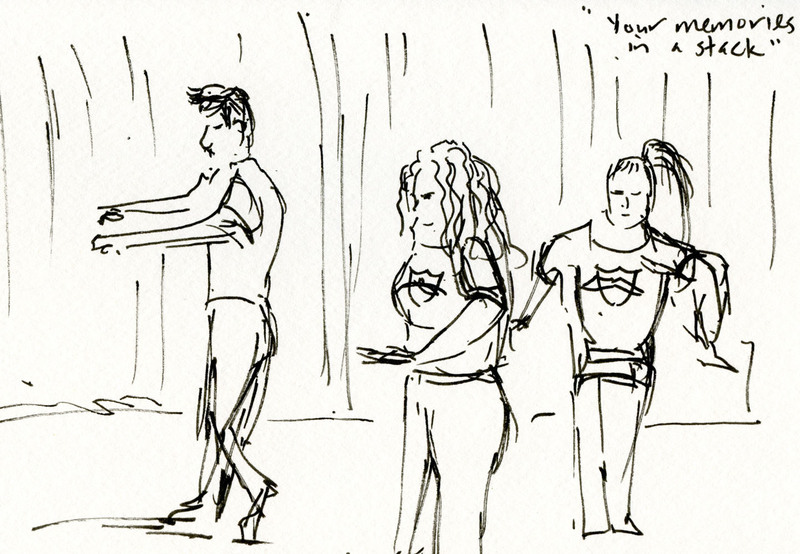 How is urban sketching related to improvisational acting? 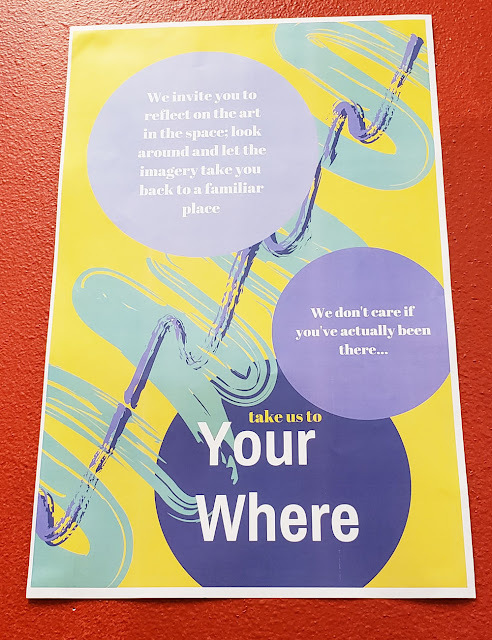 Before Thursday evening, I would have shrugged trying to respond to that question, but thanks to urban sketcher and University of Washington urban design student Robin Hunt, the answer for me is now clear: It can be an innovative, creative evening of art and interactivity. 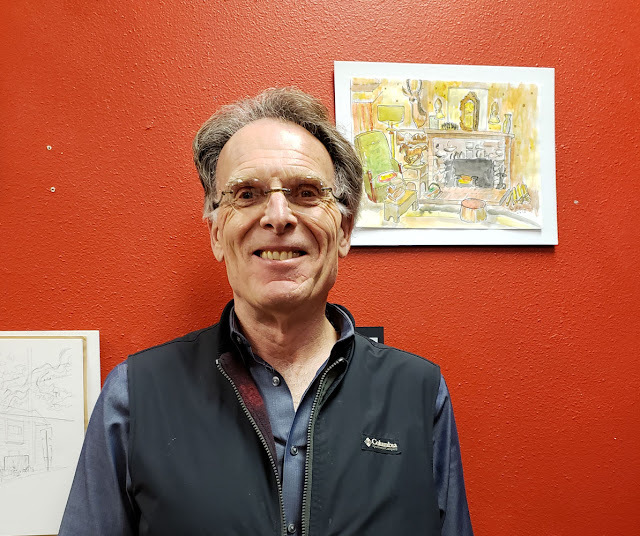 A few weeks ago, Robin invited USk Seattle members to participate in an exhibit of urban sketches in the Greenwood neighborhood’s Pocket Theater. I considered participating, but I didn’t get around to prepping my work. However, very curious about what the “interactive gallery” would be, I decided to attend the event. I was glad I arrived a few minutes before the exhibit officially opened so that I had a chance to start sketching right away before it got too crowded; the small gallery space filled instantly. Sketches of Seattle by Robin and several other local urban sketchers were displayed on two walls. 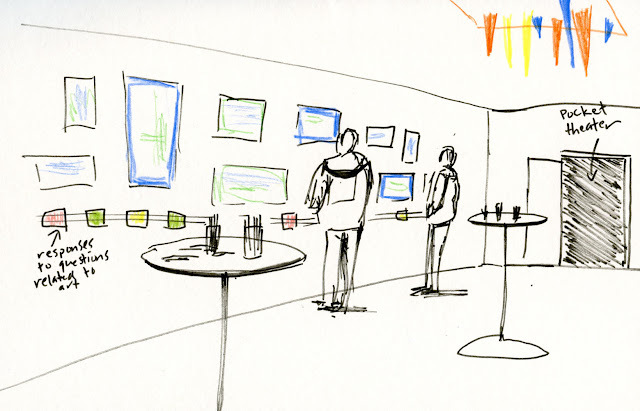 Beneath the rows of sketches were long, horizontal strips of tape, sticky side exposed. Hmmm. . .
On tables around the room were stacks of small slips of colored paper. The slips began with various open questions that could be prompted by a sketch: “Share a memory that you are reminded of.” “What is a lesson you learned in this place?” “Write a note to someone who shares memories of this place with you (please include a name).” Event attendees were invited to write their responses on the slips and then adhere them to the tape on the walls beneath the sketches they were responding to. A-ha! Suddenly my initially passive viewing of the sketches when I had first walked in was insufficient. 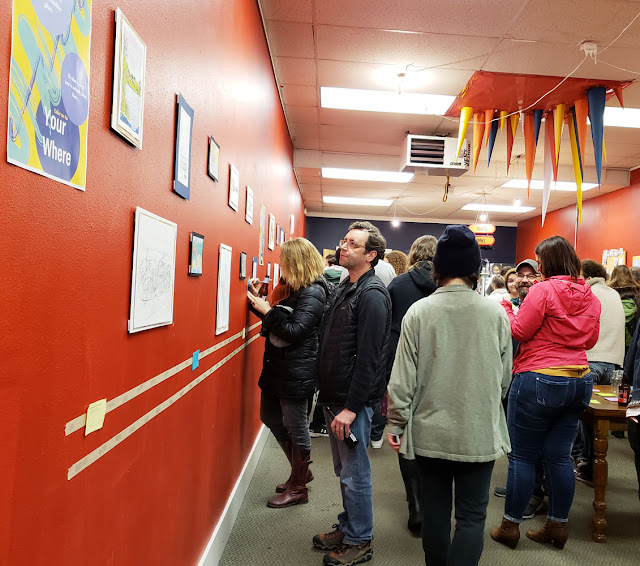 I went through the exhibit again, looking more closely at each sketch, thinking about the last time I had visited the familiar locations – Fremont, Pioneer Square, Swanson’s Nursery – or whether I had recently visited at all. 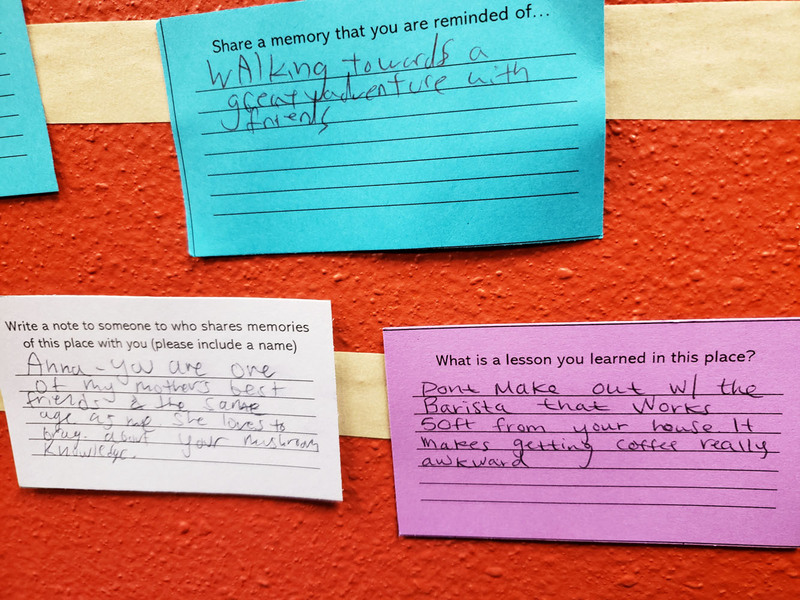 I picked up a few slips, wrote my thoughts and memories, and adhered them to the walls. Then I walked back through the whole exhibit to read what others had contributed. I had a few conversations prompted by what we were reading and viewing, and the whole room became livelier once the interactivity began. 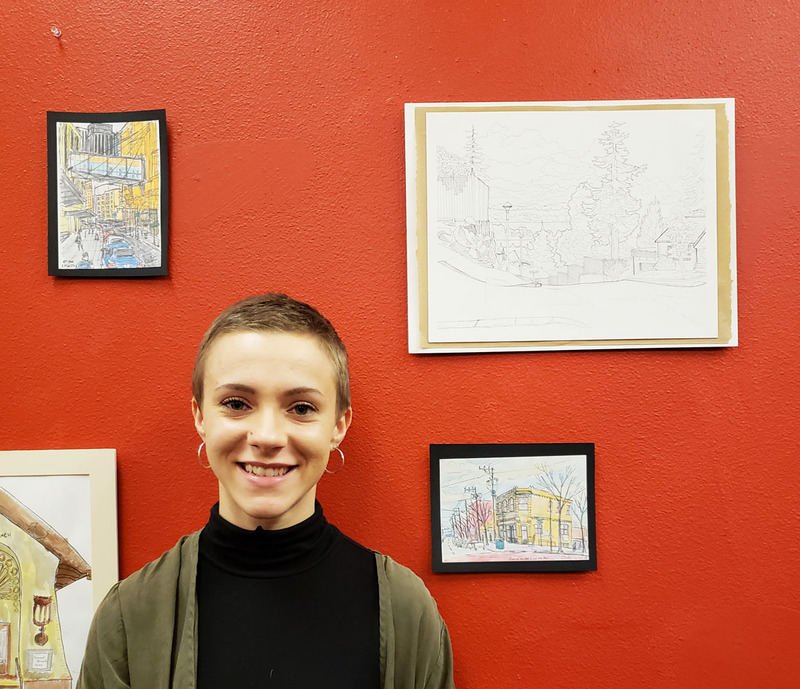 While viewing sketches of familiar places often prompts memories and associated feelings, people rarely share those thoughts. Titled “Your Where,” the event encouraged that sharing. 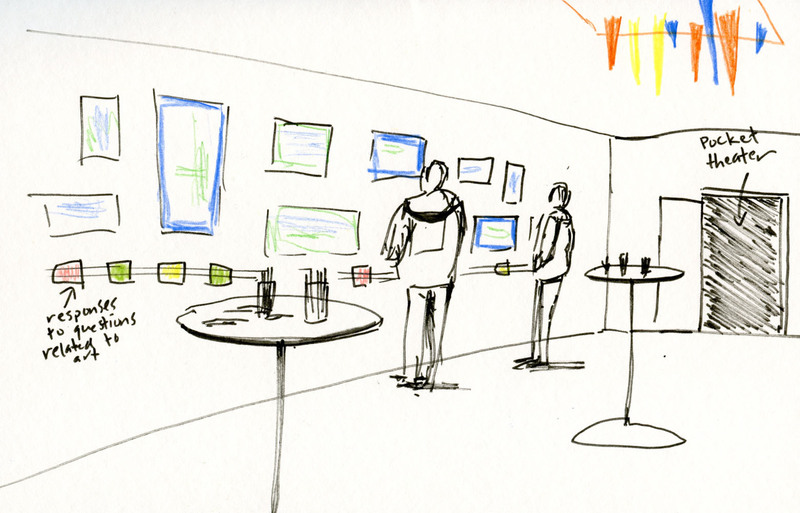 That part of the event alone would have been an innovative way to evoke memories and conversation based on sketches. But the evening wasn’t over yet. An hour after the exhibit opened, doors to the adjacent Pocket Theater opened. Every seat in the 50-seat theater filled with curious attendees. 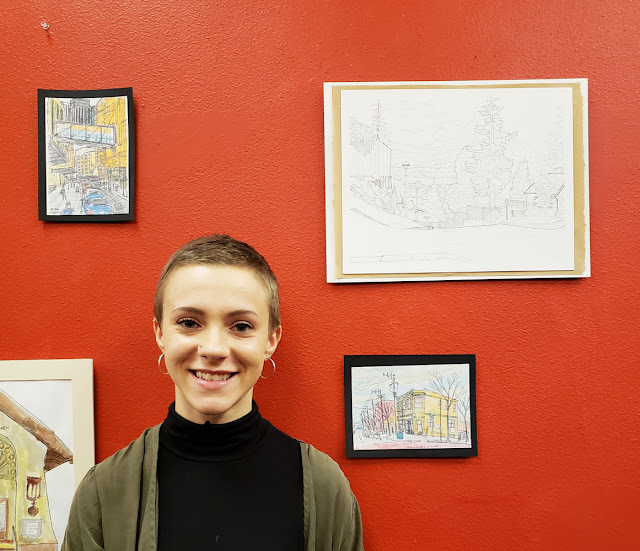 I left the event satisfied that Robin’s production (her senior project for her UW urban design-related degree) had fully answered the question of how urban sketching and improv can come together. The evening was an engaging confluence of art, comedy and audience participation.